Cast of Curious Incident of the dog in the nighttime at Steppenwolf Theatre’s Young Adult Program. 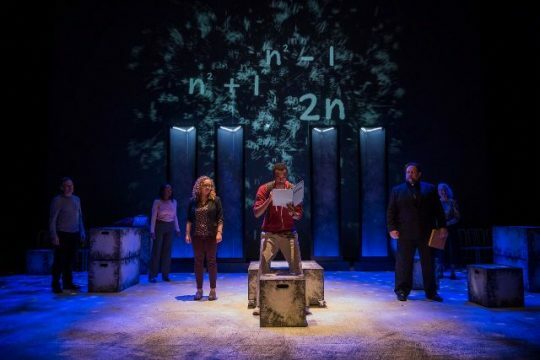 “The Curious Incident of the Dog in the Night-Time” follows the adventures of Christopher (Terry Bell) who is a fourteen year old boy with an undefined sensory processing disorder (like autism) who is also a kind of math savant. While he has advanced mental abilities on one hand, he also has limited interpersonal skills which manifest in his aversion to personal contact, his inability to tell a lie, and his propensity to take everything he hears literally. For instance, he is confused by most idiomatic phrases and metaphors. When his test proctor asks, “Are you ready to roll” Christopher simply looks bewildered. Intrigued by the mystery of the obviously intentional death of his neighbor’s dog, the young man sets out to find the perpetrator of the act. That leads him to places he has never been. It confronts him with unimagined truths while being forced to manage and overcome some of his own personal challenges. This is less of a whodunit and more of a why’d-you-do-it that forces Christopher and us to ponder themes of death, infidelity, and betrayal. In the end there is not so much of a resolution as an open ended series of unanswered, perhaps thought provoking questions. The strength of the play is providing a glimpse into an alternate state of being. Actor Terry Bell gave an excellent, well=balanced performance as Christopher. It would be easy to overplay this role but his portrayal is sympathetic and sensitive. 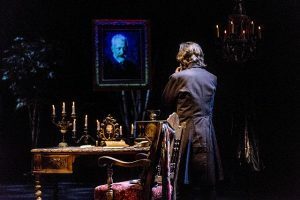 Hershey Felder in his one-man show ‘Our Great Tchaikovsky’ at the upstairs Steppenwolf Theatre through May 13, 2018. Photos by Hershey Felder Presents. Can people display numerous professions, some of which merge into one outstanding career, producing the most wonderful theatrical productions? Not many. But there is one person who is currently in Chicago, pianist, actor, playwright, composer, producer and director Hershey Felder. 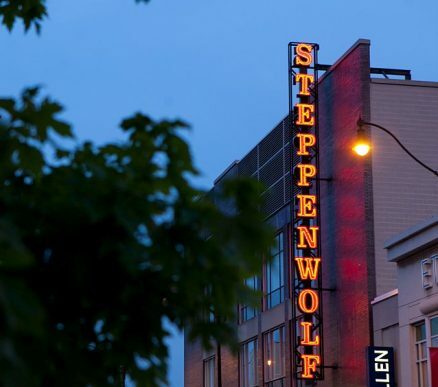 He is performing his fabulous play,‘Our Great Tchaikovsky’ upstairs in the Steppenwolf Theatre. 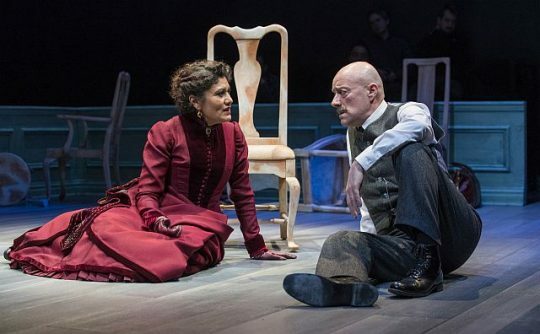 Beautifully directed by Trevor Hay, the play is a one-man performance in which Felder shares Tchaikovsky’s life through his own acting, writing, and musical talents. Cast of Doppelganger at Steppenwolf. Photos by Michael Brosilow. You know when you see a stage set with multiple doors that the play will likely be a farce. 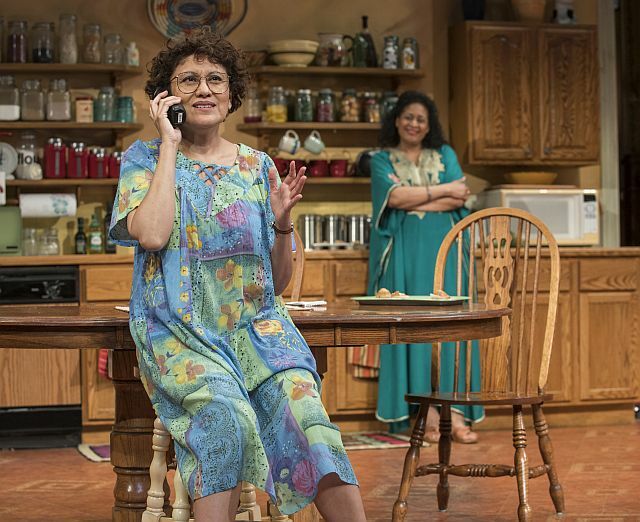 Steppenwolf Theatre Company’s set of ‘Doppelgänger,’ a world premiere with the sub title of ‘an international farce,’ has all the elements needed to keep audiences laughing, including 11 doors and another entrance. Erlbach’s presentation of global political, economic and social issues of today works superbly well as a farce. Clever lines come so quickly and author Matthew-Lee Erlbach’s obvious love of words so mesh in rhymes and tongue twisters that the first two hours speed by quickly. No stereotype is spared from a hawkish general and a skinny, uptight female British politician to an exiled African nation’s former brutal president, a bisexual Arab prince and a buxom, Brazilian money launderer.